Hello everyone! For this great annual compo, my friend frankdrey and I have come together to form team... frankdrey and 10$man! 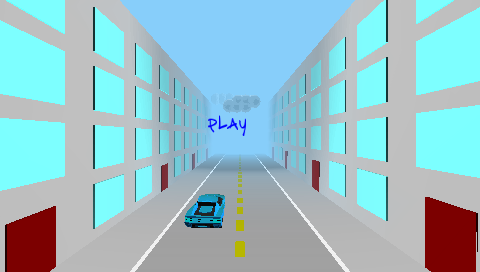 After a month (Actually, I think 3 weeks) of work, we are proud to present to you our entry, Runaway Car for the PSP! 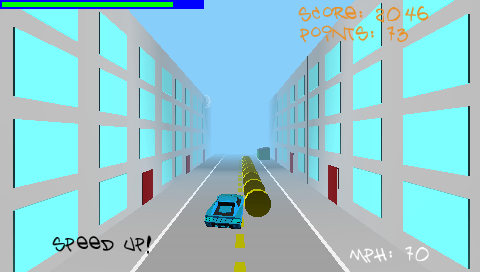 In this 3d game, you will take on the role of a car thief and race down a infinite street well evading trash cans, dumpsters and road blocks. But that's not it! It gets faster every time your score reaches the next 1000, up until 7000! How long can you survive?? Now, that's an okay concept in itself, but frankdrey and I did not stop there. We realize that this idea could get boring fast so we also present you with a car garage! When you're on the road, you can pick up some coins as you go. Then, when you have enough coins, you can go to the car garage and steal a cooler car! 7 Different Speeds to race through! Can you make it to the 7th level?? A great song custom made by Scott Pereksta! REAL Saving and Loading using the PSP's Save and Load feature! This means that you can check your highscore, how many cars you've unlocked and how many points you have WITHOUT even loading the game! Of course, as I said, there are 3 other cars to use, besides this one! Press left and right to move your car! Any object coming down the street. Any object, except for the golden coins! Don't ride up onto the sidewalk too much! This will take away a very small amount of damage. But, in a near death situation, that little bit could be the difference between life and crash! If you hit the building (You'll hear a screech) then you will steadily have health deduced! I just wanted to throw in my thoughts on this competition. So, last year was my first year entering! You may remember my entry. It was called Spacial Warfare. The game was a relatively weak entry and I walked away knowing alot more then when I came here! Some things I learned where, Neoflash is a great place! Here you can come and learn to develop for nearly every single commercial system! Last year I got a Gameboy flash cart and I now know a fair amount about the system and have made a few games of my own! It's really a great place. There's a wonderful variety of people here. As I looked through our (Frank's and mine) competition, I noticed that there were games for lots of systems! I saw N64 entries, GBA entries, SNES entries and even an Atari Entry! That's amazing! I didn't know there was anyone still developing for half those systems! I personally just hope that Dr Neo can work with us and help keep this scene alive as long as possible! Cheers to Dr Neo and all other programmers entering this competition!